When he died in the famous Boston Coconut Grove nightclub fire in 1942, Buck Jones was one of the biggest B-Western movie stars of the time. When you consider his entire successful movie career spanning 166 films in both the silent and sound Hollywood eras, he is arguably the biggest A and B Western star of all time. Embossed gold-stamped monograms on monarch mold clay chips. Monarch mold chips made until about 1950. Buck Jones’ Personal Floral Carved Leather Satchel. 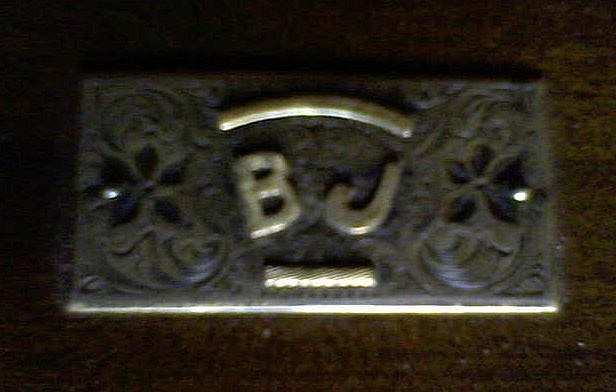 In a January 2012 auction (High Noon Western Americana Auction) this monogrammed (same as on the chips!) satchel of Buck Jones went for $2400 (including buyer's premium). "Maker-marked Al Furstnow, Miles City, Montana (on the bottom) fully floral carved leather satchel with the Buck Jones BJ brand in gold initials on the front ." Buck Jones’ Personal Sterling & Gold Ring. In the same auction, this ring, also with the same monogram as the chips, went for $1920. Further authenticity of chips in The Gaming Table. 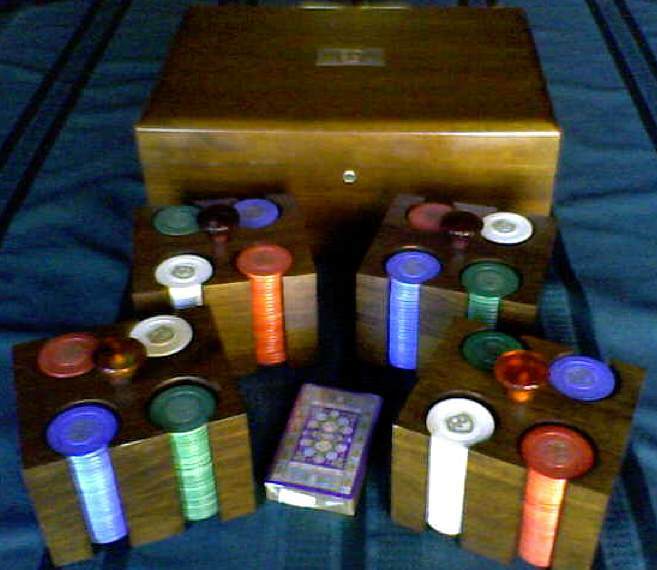 The chips are noted in the 2009 edition of The Gaming Table, p. 58, excerpt on left. 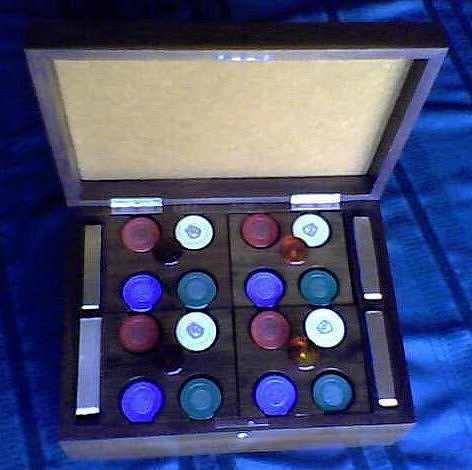 Incidentally, the person who sold the chips to me said, "This poker chip set was purchased from Buck's wife, Dell, over 30 years ago." 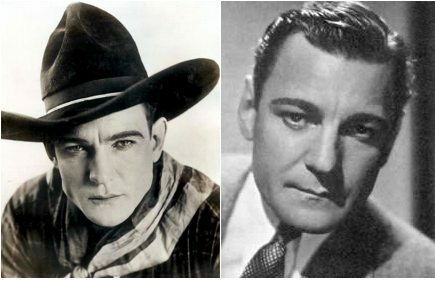 Links to biographies and IMDb filmography on Buck Jones (December 12th, 1891 -- November 30th, 1942). My Biography of Buck Jones. Buck Jones (1891-1942) was born and raised in Indiana. Before becoming a movie star he served in the Army (was 16; he lied about his age) where he saw action in the Philippines and against Pancho Villa before his discharge in 1913. After that he worked in Wild West shows and as a Hollywood stuntman. He became one of the top cowboys of the silent era along with Tom Mix and William S. Hart, and was one of the few Western stars to make it in the talkies, and even withstood the singing-cowboy craze of the late 1930's. 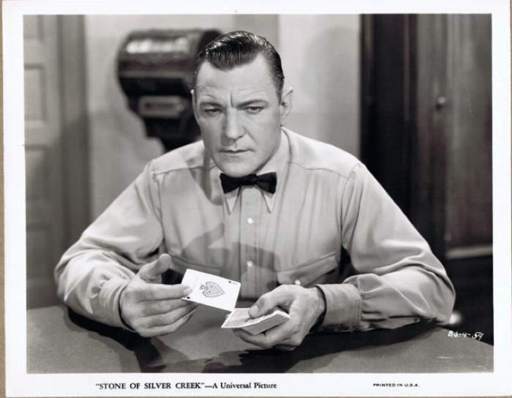 Jones was one of most popular movie stars of his day, especially Western stars. He was described as "Tough. Good-humored. Convincing. Tall in the saddle." He "exhibited a warmness and strength that was missing in many of the western film heroes." "And he was allowed to demonstrate his folksy humor ( sort of Will Rogers style ) in his films." After making 167 movies, serials and B-westerns, while on a personal appearance and war bond tour, he tragically died in the famous Thanksgiving night 1942 fire at the Cocoanut Grove nightclub in Boston. 492 people died there. 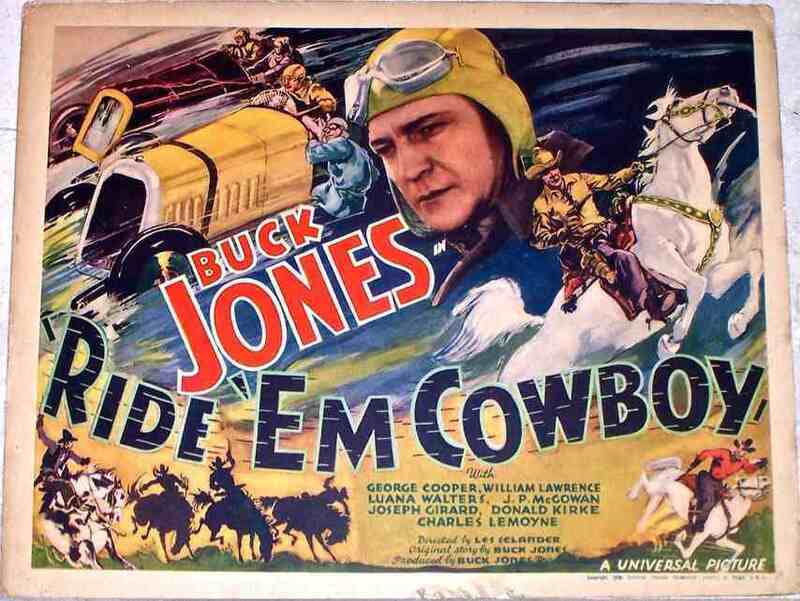 In 1936, Jones was ranked the number one cowboy star in polls conducted by Box Office and the Motion Picture Herald. The national Buck Jones Rangers Fan Club boasted five million members, and for a brief period of time, Jones received more fan mail than any actor in the world, including Clark Gable. In 1936 Gary Cooper was the highest salaried movie star at $370,214.00. Ken Maynard, a leading Western star, is listed at $37,100.00, and Buck Jones' income for year 1936 was a respectable $143,333.00. Jones' status and name recognition brought him many endorsement deals including Royal Crown Cola and Post Grape Nuts Flakes. Jones was also a consultant for Daisy, which issued a Daisy "Buck Jones" model pump action air rifle. 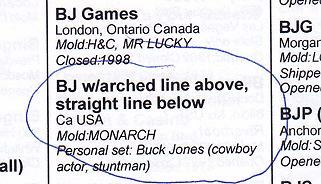 The "Buck Jones" comic book series went on for many years. Buck Jomes comic books. He first appeared in the short-lived Wow comic in 1936. 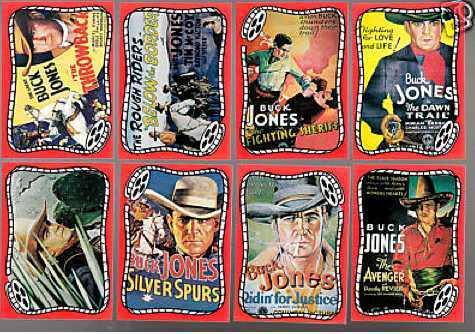 Then in other titles, eventually "Buck Jones,"
in a comic book series run by Dell Publishing House. "The series ran roughly until 1953." Source. Ride 'em Cowboy, the 1936 Lesley Selander automobile car racing sports cowboy western starring Buck Jones. This lobby card (11 x 14") is worth several hundred dollars. Two 8 x 10" movie stills of gambling scenes from two of Jones' movies, from my site. left: Buck Jones in "Stone of Silver Creek" (1935). 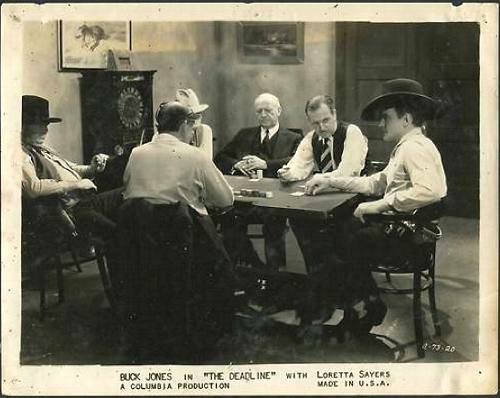 right: Buck Jones (far right) at a gambling table, in "The Deadline" (1931). Rare trading card measure 2 1/2 x 3 1/2 inches (same size as a standard trading card). The card pictures 8 movie posters from Jones' movies.